The Dolomiti Superski, a massive lift system of over 500 lifts under one ski pass, provides the access to some of the best off-piste skiing in the world. We are excited to offer this unique ski adventure unlike anything else you will find anywhere. Using the the Dolomiti Superski lift system for transport, we spend a week exploring some of the best backcountry off-piste skiing options the Dolomites region has to offer - broad valley runs, steep couloir skiing, glacier powder runs, the Dolomites has it all. We explore the off piste ski runs of such legendary names like the Gruppo Sella, Piz Pordoi, Tofana and Lagauzoi. Due to the ease of access, we keep the hiking and the touring to a minimum and maximize the vertical. We begin in the historical town of Cortina d'Ampezzo in the heart of the Dolomites, site of the 1956 winter Olympics. We then take to the ski lifts and use them to travel around the region for the remainder of the week - no car transport needed. We will stay in a combo of high mountain on-slope hotels with private rooms and cozy village inns. On some days we will have a luggage transfer to a refresh of clean clothes, etc. The Dolomites region is renown for it's cuisine and evenings are spent sampling some it's finest food prepared by chefs. 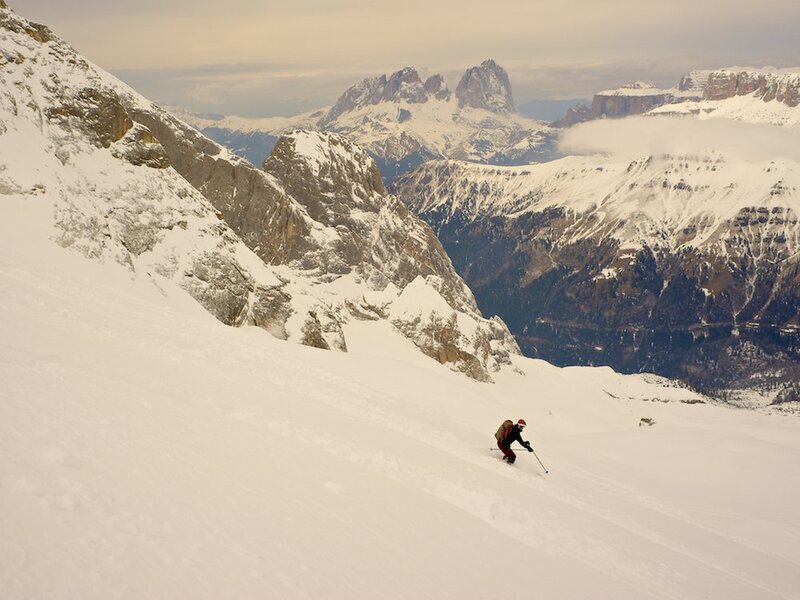 Dolomites skiing can be superb with choices ranging from steep broad valley descents such as the Val Mesdi and the Cresta Bianche, couloirs such as the Bus de Tofana and high elevation powder skiing on Marmolada, the Dolomites largest glacier. 24,000 foot verical days are very possible. Even in bad weather there are many possibilities which is something you can't say for a lot of other backcountry skiing destinations. The Dolomites off piste ski is very appropriate for split boarders and for skiers with limited touring gear. The hikes are very short and the ski descents very long! Expert level skiers and split boarders with some previous backcountry, off-piste or heli skiing experience. You should be comfortable skiing double black diamond runs at a resort in most any conditions. 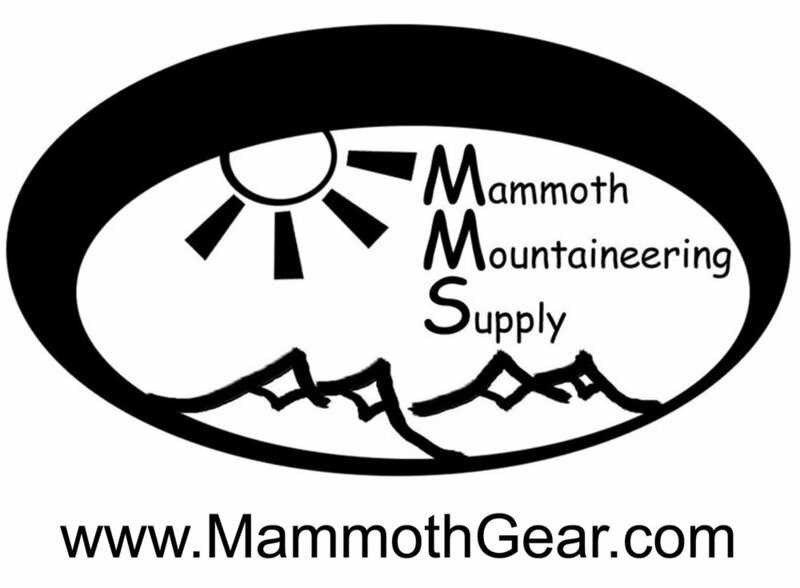 No previous mountaineering experience is required. Very good physical condition is required. The Dolomites off-Piste Skiing trip includes all of your lodging with breakfast, dinner, all lift tickets and ground transport. Lunch options are not included but there are many choices including gourmet on slope restaurants. Custom dates available for individuals and groups. We specialize in custom international trips. Note: We will keep the exact ski descents very flexible so as to pick the best option for the day based on weather and snow conditions. Ski lifts up to Cristallo, one of the ski areas in the Cortina area. One of our off-piste options is the Cresta Biancha, an exciting valley run that begins with a short rappel from the top. We stay back in Cortina for the night. We leave Cortina via ski lift and make our way to the top of the Tofana ski area where we will attempt the Bus di Tofana, a long and sustained off piste couloir that deposits us down by the Cinqi Torri lifts which we will use to make our way to an on-slope refugio for a gourmet lunch. After lunch we take lifts and possibly another off-piste run on our way to the top of the Lagazuoi cable car to the Rifugio Lagazuoi where we will spend the night atop the mountain. From Lagazuoi we have many options for couloirs and wide backcountry valley skiing in the morning depending on the group’s goals. In the afternoon we take the famous piste run down to Alta Badia with another Rifugio lunch on the way. At the bottom of the run we take the “horse lift”, basically a horse drawn sleigh that drags us across about a mile of flat terrain where we connect with the Dolomiti Superski lifts again. We then take a backcountry run down into the village of Arabba where we spend the night in a hotel. We have a luggage transfer this night. Skiing right from the hotel we board a series of lifts that take us over to Marmolada where we board the cable cars that take us close to the highest point in the Dolomites. We will ski multiple glaciated runs on the Dolomites largest glacier. Each run is about 6,000 vertical feet each... today could be a lot of vertical. We stay back at our hotel in Arabba that has a well-earned spa. 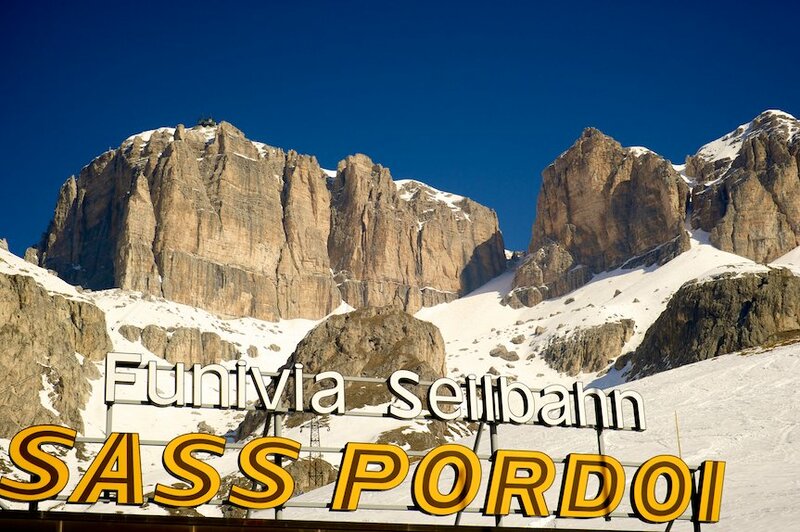 Today we ski over to the Sella Massif and up to the Piz Pordoi cable car. 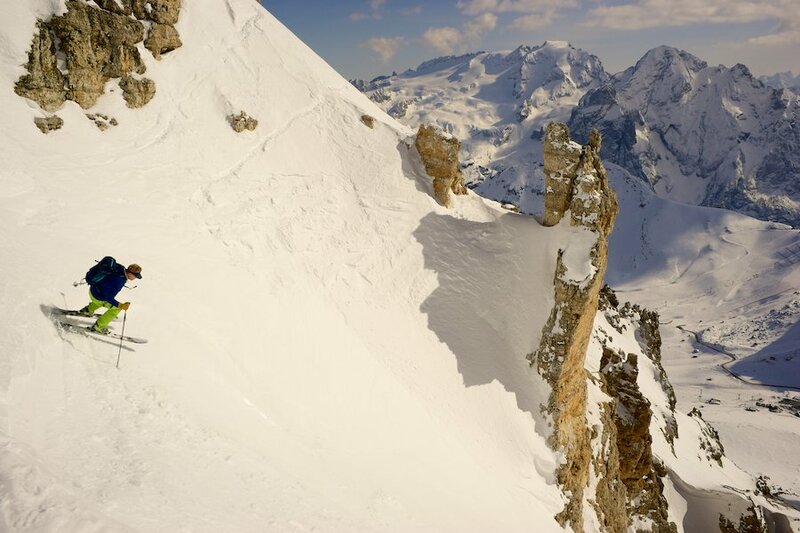 From Piz Pordoi we have many, many options of steep couloirs to ski as well as the Val Lasties. We will choose according to group goals. We spend the evening at the Rifugio Fredarola which is at the top of the lifts and perched on a steep valley with expansive views of Marmolada. Leaving Fredarola, we once again ascend the Piz Pordoi cable car and begin a 30-40 minute hike over to the entrance of the famous Val Mesdi, a long and beautiful backcountry valley that takes us to the other side of the Sella Masif into the town of Corvara. After another on piste lunch at a local refugio we will make our way to the Hotel Pralongia at the top of the ski runs for the night. Leaving Pralongia, we will ski a beautiful backcountry run through the trees down to Armentarola and then a short cab ride up to the Falzarego Pass where we will have numerous options for couloir skiing or perhaps a short peak ascent before another gourmet on-slope lunch and then a final descent (with short bus ride) back into Cortina d’Ampezzo. We stay back in our hotel in Cortina for the night.